As part of SUMMIT ’14, Shri. 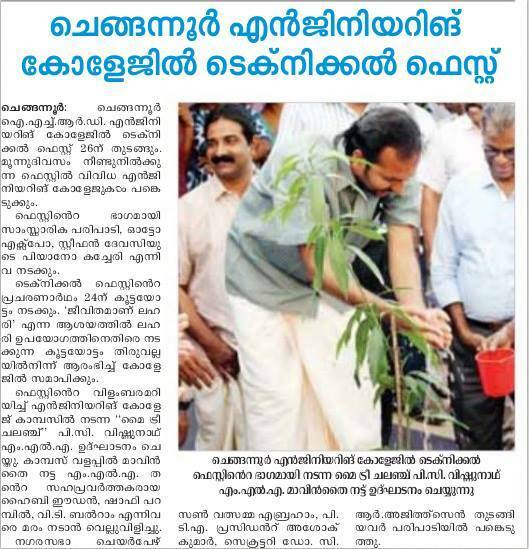 P C Vishnunath MLA took part in the My Tree Challenge program in our campus on 17th September 2014. He also challenged Shri. V T Balram MLA, Shri. Hibi Eden MLA and Shri. Shafi Parambil MLA to take up the challenge. A video of the event and a news report are given below. This entry was posted in Arts and Related, CEC Senate, College of Engineering Chengannur, SUMMIT and tagged Balram, CEC, CEC SUMMIT 14, CEC SUMMIT 2014, Chengannur, College of Engineering Chengannur, Hibi Eden, MLA, My Tree Challenge, MyTreeChallenge, P C Vishnu nath, P C Vishnu Nath MLA, P C Vishnunath, P C Vishnunath MLA, Shafi, Shafi Parambil, SUMMIT, SUMMIT 14, SUMMIT 2014, V T Balram, Vishnunath MLA. Bookmark the permalink.